I grew up in the Philippines where corn is a staple food of about 20% of the country’s population. Whenever it was corn season in our province, our dining table always had corn on it: steamed, boiled or grilled corn on the cob (nilaga or inihaw na mais) and boiled whole kernel corn with coconut (binatog) for snack, buttered whole kernel corn as side dish for grilled chicken or pork, whole kernel corn as part of a soup dish and baby corn as part of our favorite vegetable dish called chopsuey. 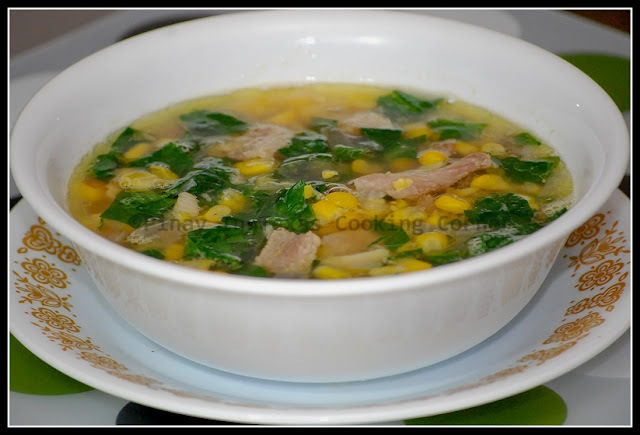 Corn and malunggay (moringa or sajina) soup was my mother’s favorite. She used to cook it so often that it became my favorite too. I was missing it last Friday…but I didn’t have malunggay. I wanted it so badly that’s why I thought of just using what’s available, which at that time was spinach. I know that spinach and malunggay taste different, but the flavors of corn and spinach really work well together. I cooked this soup just like how my mother used to cook her corn and malunggay soup. I just substituted malunggay with spinach…and it came out really good! Check it out! * I shared this on Melt in Your Mouth Monday and Hearth and Soul Hop. 1. Sprinkle pork with a pinch of salt and pepper. 2. In a covered saucepan over medium heat, cook pork in 1/8 cup water until water evaporates and oil comes out. 3. Add olive oil and sauté pork until brown. 4. Push pork to one side of the saucepan. Add garlic and sauté until light brown. 5. Add onion and ginger. Saute until onion is translucent. 6. 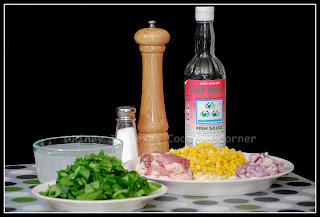 Add corn. Saute for a minute. 7. Add water and fish sauce. Mix well. Cover and bring to a boil. Adjust heat to medium low and simmer until corn is tender. 8. Add salt and pepper to suit your taste. 9. Add spinach and simmer for a minute or two. looks yummy although I don't cook pork at but do try outside. Great and easy recipe! I love it!!! Will save it for when it gets cooler! :-))) Thanks for sharing!!! This looks delicious ... thanks for stopping by my blog and taking the time to leave a comment ... I'm your newest follower! Oh that is just absolutely delicious! I love that there's spinach and pork in there... tasty, indeed. Great recipe! Thank you for adding me to your Links page!!! I truly truly appreciate it! Thank you for linking my blog, certainly this is great and appreciate it very much. For sure love it very much. My family loves pork in soups - I am sure this would be a hit, I am glad you shared this lovely dish with us at the Hearth and Soul Hop - and how it reminds you of your mothers dish.